In this Nikon D850 vs D810 vs D800 / D800E comparison article, I will go through all the differences in specifications between these DSLR cameras and talk about what has been added, changed or improved with each generation. While both Nikon D810 and D800 / D800E cameras have been very popular among many enthusiasts and professionals for the past few years, the Nikon D850 is clearly a huge step up in many ways for the D8x0 line of cameras. It is the first high-resolution Nikon DSLR that is aimed at many different photography genres, from landscape and macro, to sports and wildlife photography. 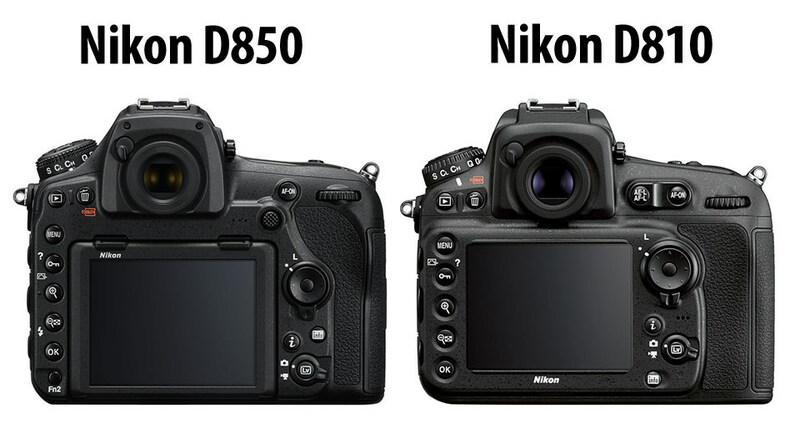 Let’s take a look at what the D850 brings to the table when compared to its predecessors. Just looking at the highlighted areas of the above chart, it is very easy to see what Nikon has done with the D850. Not only does it outclass its predecessors, but it does it in a big way, especially when it comes to important feature changes such as back-illuminated CMOS sensor, higher resolution, larger native ISO sensitivity range, much better AF system, better AF detection range, faster continuous shooting rate, faster processor, larger viewfinder, XQD and UHS-II SD card support, silent shooting, better battery life and 4K video. In addition to these, the D850 adds a bunch of new features such as focus stacking, focus peaking, tilting touch-screen LCD, in-camera batch RAW processing, button illumination, WiFi + Bluetooth, and silent timelapse shooting that we have previously not seen on the D8x0 cameras. In short, the D850 presents a massive upgrade over the D810 and especially over the D800 / D800E DSLRs. There is only one area where the D850 significantly differs compared to the D810 and D800 / D800E cameras and that’s built-in flash. Some photographers might look at this as a negative (since one would lose the ability to use a built-in flash for fill flash, or to be able to control other speedlights), but considering that Nikon was able to improve the weather sealing of the camera by dropping the flash, it could be looked at as an advantage instead. As you can see, there are many ergonomic changes on the D850 when compared to the D810. The AE-L / AF-L button has been removed and a joystick has been added right below the AF-ON button (if you are a heavy AE-L / AF-L button user, don’t worry – it can be assigned to any of the function buttons, or to the joystick). The joystick is a big deal ergonomically, because it makes it very easy to go through focus points when shooting, so you no longer have to rely on the multi-function buttons for that. A new “Fn2” function button has been added to the left of the LCD and you can assign any of the menu items or camera features to this button, which is great. The LCD screen obviously appears different, because it is now a tiltable touch-enabled LCD. In addition to being able to pinch-zoom or swipe through images, you can also use the touch-enabled screen to focus on a subject in live view mode, or navigate through the menus. There are a few other smaller ergonomic changes, but those are minor and mostly cosmetic. Now the biggest question is, should you upgrade? If you shoot with a Nikon D800 or D800E, the D850 is definitely worth moving up to. Even if you don’t need all the crazy fps and 4K video features, there are three most important features you do not want to miss – electronic front curtain shutter (EFCS) + silent shooting, ISO 64 for improved dynamic range and a much better autofocus system. If you already shoot with a Nikon D810, then it is a question of what you shoot and whether you truly need the new features highlighted in the above table. If you only shoot landscapes, it might be worth skipping a generation, since the D810 is an excellent camera already. However, if you shoot landscapes and wildlife, and especially if you already own a D810 and a D500, the D850 would be a solid camera to move up to – it could replace both of those in a single package. If you want to find out more about the D850, check out my Everything You Need to Know About the Nikon D850 article. This is the update I’ve been waiting for. I’m an avid professional Nikon full frame camera and video user and have been holding off till a significant upgrade came along and this is it. The upgrades are significant enough for me to change bodies. Torben, Nikon has really done it with the D850…I cannot wait to test one out! How does the D850 compare with D5? There is a chart on-line I found. After reviewing it I eledted to just buy 2 D850’s instead of having a D5 and D850 in my arsenal. The informative articles keep coming – how about reviewing your d850 wish list in the light of the real one. I note GPS and an enhanced AF-auto-tune did not make it. This would highlight what in fact is missing as well as great about the camera. Pravin, that’s a good idea, thank you for the suggestion! Im looking into buying the D850 for weddings and dont plan on shooting full rez at all. M fine would be what id shoot as default. the sigma 18-35 is a good midranger for me but was wondering what id give up which isnt obvious? I do not have to hesitate to buy the D500 as a second body. The old D810 will be the second body. I look forward to D850! I’d think, can you confirm, the Bluetooth will pair with and support GPS for a location source? Also mentioned in the roll-out video was a feature and linked accessory for automating scanning of color or monochrome film negatives. I didn’t see that mentioned above. As for the flash, I’m glad I kept my old SB-400. I enjoy your comparo articles, Nassim- they show so much! When you review the D850, it would be great if you could check in on one specific irritant that I’ve found on Nikon’s DSLRs recently. I have the D7200 and the D750 (along with the older D7000, D5200 and the D5100). The rear screens of the D7200 and the D750 take about a full second to wake up (when one pushes any button whose function is mapped to the rear screen), when one uses the camera for some time with the rear screens off. After the initial delayed ‘on’ time, the screen turns on quickly if it is woken up within a few minutes. If you keep it off for a reasonable amount of time, the screen takes its sweet time (~1 sec) to wake up again. I’m not sure if this is a bug, or a ‘sleep’ function programmed poorly, but as a result, the newer D750 and D7200 take much more time to adjust in the middle of a shoot compared to the 6 year old D5100. Its a major irritant, as key functions like ISO, WB have now been mapped by Nikon to the rear screen instead of the top LCD. All DSLRs have up to date firmwares. Do the D8xx series enjoy the same leisurely rear screen wake up time? It would be interesting to see. I have never experienced this with my D810 or D700. I’m curious though, can you see if you have the sensor cleaning enabled for startup? Sensor cleaning is on at its default setting. But the problem is not when the camera is switched on, but when you ‘wake’ the rear screen (after its been sleeping for a while) by pressing any of the function buttons mapped to the rear screen (WB, ISO, etc.). On the D7200 and the D750, these buttons wake the rear screen. On the D7000, these are mapped to the top LCD screen and the rear screen is woken up only when one presses ‘Info’. As far as I can tell, there is no sensor cleaning going on when the screen wakes up. I tried it on my D800 it rear LCD wakes up instantly. Buttons you have mentioned are not mapped to rear lcd of D800. I dunno then, I have never experienced this with my D700 or D810. I don’t recall anyone at workshops having an issue with the D750. The function that used to be named ‘auto meter-off delay’ and is now more accurately named ‘standby timer’ (both in the C-Timers menu), is probably what you are dealing with. It basically sets the camera into a standby mode after a defined period, which then requires the camera to wake-up when you select any button linked to the screen. I think by default the timer is 30 seconds, but you can set it from anything from 2 seconds to never-off. Of course, if you select a long time period, you are likely to run the battery down faster. I have never set it to longer than 30 seconds, so I would be interested to know about battery performance when it is set at ‘never-off’. Peacefull mind for just other 4 years…untill Nikon develop a new model. It is no possible to run behind the new models. There is only the pleasure to take good images nathing more. One last comment. I don’t think the new ISO button is going to be very convenient in its new place. That’s not such an easy spot to access one-handed (button + dial) when your face is pressed up against the camera. I liked it better two-handed (button one hand, dial the other) where it was on the D810. You will most likely be able to assign the image area selection to the click function of the new AF joystick. On D800/810 the red video record button could be assigned to change ISO settings in combination with the front and rear wheels. Index finger on the red button and 2nd finger for the front dial , thumb on rear dial. Maybe a bit of a sfretch if your hands are smaller but for me it is infinitely superior to the two hand operation using top left dial and allows changing of ISO settings while looking thru the viewfinder. Excellent article. Now we can compare, than you. For me it’s easy. The D810 includes a free D500 inside. Since all my glass is FX I would need to buy at least the 16-80 lens with a D500 and then the price is not far south of D850. One area to look at is the price of used camera bodies. At $3999 this may undercut the used market. D4s is currently $3799+, D4 $2799 +, $D810 $2099+, D3X/D750 around 1650+. With the upgraded feature set including higher frame rates, it may pull upgrade shooters from APSC and undercut the used market. For those buying used bodies – always filled with risk- I think this drives down prices. This is the route I am going. I have a D700, loyal fan and user. It is my backup and travel camera of choice. I also have a D3x. I shoot sports, livestock, dogs doing any kind of work you can imagine, pet portraits, and ranch commercial work. So, I do portraits, action, and landscape type work. I drive studio lighting at times, and speed light if I need fill outdoors. The D700 did not give me the ISO range I really needed so bought a used D3x a few years back. I have used the heck out of that camera body, in and out of bad weather, and I really need to replace it. I’ve been looking at D4s used bodies, but honestly with the price point, the D850 gives me all I want and more. I know I will have to wait a few months (did not do the pre-order thing, let them work the bugs out), but it will be my next purchase. I like the smaller body size and how I can use some of the new back buttons, rocker switch and LCD. Being able to go to ISO 64 will be a plus for me too (can’t always use flash for animals in their natural setting). I don’t think I will be disappointed. I’m in same boat with D700 and the same type of photography, but with a bit of architecture thrown in as well. looking to upgrade from D700. thank you for doing the review. i was waiting on your review. Am still sh[ting with a d700 so as soon as i see some photos taken with camera. I will probably ait almost bought the d5 but was waiting on the new camera to come out. Nasim, thank you for the informative and comprehensive comparison table. For me, the standout new features are Stacking, buffer size and the superior sensor. The loss of built-in flash is a big negative for me. I notice the D850 pixel density at 4.347 microns remains a long way from the 3.917 of the D7200. Larger sensors translate to higher quality prints. The next logical step is expanding Nikon’s 3.917µ technology to FX. This would yield a 9165 x 6110 sensor at 56 MP. Pixel spacing is 55.43 microns with a 20-inch print. The Canon is already at 50 MP, so this next step should be doable. This reminds me of the muscle car engine development in the 60s. The D850 requires the WR-R10 wireless remote controller and WR-A10 adapter for wireless radio flash control, it’s not built into the camera. The same controller and adapter are also compatible with the D810 and D800/D800E. Interval Timer Resolution should be renamed Timelapse Resolution. The interval has always supported maximum size RAW files for post-processing later, which is about 7.5K on the D810 and D800/D800E (just shy of 8K after cropping to 16:9 ratio). The timelapse mode, where the camera does not keep RAW files but generates a video file instead, was limited to 1080p on previous models and is limited to 4K on the D850 (8K and higher is only available in Interval mode as before). Thank you for another great article. I read with interest your first article on the D850, and I was blown away. I’ve owned the D810 for a bit more than a year and absolutely love the camera. BUT, the D850 looks WOW!!! I am assuming it does – expeed 5. Nowhere in Nikon’s official D850 brochure does it specify the D850 can write RAW 12-bit Lossless Compressed Files into its Buffer. The most important things Nikon needs to do is to make damn sure there are no issues and if so, make it real easy to fix/replace. They need a PR win. I do like that the focus stacking idea was conceived by the engineers and not the marketeers(?). thank you for the comparative analysis. My D810 is 8 months old with about 8,000 shots. I like it a lot and it has much useful life left in it. I would buy the D850 if it could do video at 60 fps in 4K. The 850 records in MP4 format which is big improvement. I do not use the D810 for video because it is restricted to MOV format. I need a new 4K Sony camcorder, which will cost about $1,000. Using a camera for photography and video saves money and the trouble of lugging around a second device. Selling my D810 and buying the 850 is very tempting. What are the Benefits of back-illuminated CMOS sensor? Thanks for the detailed comparison. Two points stem from owning a D800 since launch, firstly does the D850 address the issue of saving settings in the way that D750 allows user to switch from one to another and has the shutter system changed so as not to deposit oil and dust onto the sensor with the need for regular cleaning? In reply to Elaine . the d500 joystick can be programmed to various tasks .I assume d850 will be similar. I have back button focus set for single point and pushing joystick gives me group . excellent and exciting article as always ! Small question: do you know if the D850 shutter is similar mechanically to the D810 one ? Excellent Table, But i believe the price is too high. I’m using D800e and D610… But felt… Light is important for Bird photography… Higher ISO can ruin the clicks.. The price is too high?? Its exactly the same as the provides two models. No sticker shock. Next, you would be complaining the subsequent D7xxx is no D850 killer. I wonder how much of the CIPA battery life numbers difference is caused by the lack of flash. If I remember right, a camera with a flash, when testing battery life, has a certain percentage of flash pictures taken. Could that alone explain the difference? I held off upgrading my D800E to the D810, and bought the D5 last year. I will upgrade to the D850 next year, because for some reason the release price at one authorised Nikon retailer has it set to just over $5,000 AUD ($4,000 US). It’ll be interesting to see what happens to the price over the coming months. I’m located in Australia, not the US. Nasim, I hope, you get quick with D850 review, you are one of those, I trust the most.. Very nice feature set for the D850 . However , I’m sticking with the D810 for now and see if Nikon comes out with a FF mirrorless . I shoot mostly portraits and landscape , so I can do without the other features . Still it’s an excellent price point for such a feauture rich camera . I am in a rather similar position. I was an early D800 adopter, which I use primarily for landscapes. Whilst I accept that the D850 has a lot to offer, the apparent emphasis on speed is not that relevant for me. In addition there are a number of other issues that I regard negatively from a landscape perspective (lack of GPS, slightly increased weight). I will also probably wait until I see what Nikon has to offer in the way of a FF mirrorless, before upgrading. Also the high price point of the D850 (outside the US) makes the decision to wait rather easier. In the UK the D810 currently sells for £2100 (admittedly an ‘end of life’ price), whereas the D850 is £3500. There is clearly a high ‘early adopter’ premium. Nasim, thanks for the review. Is the target audience for this professionals or advanced amateurs? It also makes me wonder if Nikon is their own biggest competition. FWIW: On D500 size; 5,568 x 3,712 = 20.67 MPix, not 25. I am interested in the bracketing of the Nikon. With the d700 you can bracket 9 exposures but can only go one stop apart. The canon mark 4 can do 7 but at three stops apart (which I find useful in my line of work). Can the Nikon D850 go beyond 1 stop brackets and how many shots can it shoot in a series? The D810 body is NOT full magnesium alloy. I guess a professional photographer considers several things before upgrading to D850 from D810. 1) Final result… Think that you have the same photo session with D850 and D810. Check what you get with each Camera. For my photography style, the only difference will be the sizes of the photos, which does not impress me. 36MP is already more than OK for me. 2) Ease of use… I consider In the photo session what makes use easier. Tilting screen maybe… Boosting ISO sensitivity, focus stacking option, continuous shooting speed does not impress me either. I am not forcing ISO speed. I’d rather do focus stacking in post production if I need, which doesn’t happen often. So far I did not miss any valuable photo just because of 2 less shoots per second. For wireless solution, I use TP LINK TL-MR3040 with my D810, and I am happy with this couple. D850 is surely better camera than D810. But I have already D810 with which I am very happy. The photographer should think what would make his photography better. For some the answer is a new camera. For the others, the answer is inspiration which leads to trying, experiencing and discovering new techniques. In short I will not upgrade as I think D850 will not make me a better photographer, it will not make my life much easier, it will not be the reason of my better photography. I do have a D5, D810 and D500. Was planning to buy another D5 to replace D810. But, now I’m thinking of D850. For wildlife action photography, will D850 perform well? FWIW: The D810 buffer in FX has a capacity of 28 14-bit Lossless Compressed, while the D850 has a capacity of 51 such shots. In DX mode, the D810 buffer (see page 490 of its manual) has a capacity of 97 14-bit Lossless Compressed. Based on that ratio, in DX mode the D850 in DX mode could be around 170 shots. I say around because of the FPS rate, and the possibility of a 100-shot limit built into the camera (unknown at this time). The size of DX pictures from the D850 is 19.47 MPix (5,408 x 3,600), while the size of D500 pictures is 20.67 MPix (5,568 x 3,712, see page 94 of the D500 manual); which makes the D850 pictures only 1.2 MPix smaller. This 1.2 MPix difference is so small, that the D850 could almost work as a D500 as far as reach, with the added benefit of FX light capacity; typically 1-stop difference between FX and DX cameras. I’m betting the A7riii will blow the socks off this D850 from a dynamic range POV. As you mention above, this is a good update for general/sports/wildlife, but minimal/incremental for most landscape. For my purposes as a sports photographer, I am not concerned with any more MP or small changes in DR/ISO etc. What interests me is the ergonomics and the AF tracking, which I was able to test briefly in a local camera shop’s evening event. The AF is very good. I couldn’t tell much difference to the D5. At 7fps the body is stable and not too loud. I couldn’t check the LV silent shooting unfortunately. The handling is also excellent. It’s like a cross between a D500 and D810, being just slightly taller and thicker than the D500, but feeling more secure in hand than the D810. The viewfinder is excellent. Basically the best Nikon have made, probably since the F5. It appears to be optimised for faster than F2.2 lenses as others are, but I haven’t confirmed that. What I would like to see if how it performs with the grip, and whether without grip there is a fps boost in 1.2 and dx crop modes (the manual doesn’t mention that unusually). However, when considering also the big increase in battery life, I can already say that this would work well as a sports body at 7fps. Obviously not quite as good as a D5 for speed or D500 for AF coverage, but a completely useable sports allrounder body. With 5,000 shots using the grip and 9fps, this really feels to me like the D700 and MB-d10 update many have waited for, with a ridiculous amount of MP thrown in for free! Can anyone answer 2 questions about the D850 vs. the D810 I can’t find discussed anywhere. 1. Is the D850 medium raw file a “true” raw file (unlike the D810 small raw)? 2. Is the D850 faster getting the picture displayed on the viewfinder? Don’t understand why in the USA the D850 is the same exact price as the D810, while in Canada the D850 is $600.00 more than the D810(yes, six HUNDRED dollars). This is a scam bordering on fraud, no if, but or maybe. Nikon need to get their price structure in order ASAP, it’s not like customers are oblivious to what is happening outside of their own country.